Mt. Kailash Manasarovar via Simikot trek gives you an opportunity to enjoy the natural beauty of both the Nepalese and the Tibetan landscape. In this trip we make our way to Mount Kailash after a long and strenuous walk from Simikot in Nepal, and after a pleasant drive from the Nepal-Tibet border. Mt. Kailash Manasarovar via Simikot gives you a new experiment and support for proper acclimatization. This is why, many more tourists prefer Mt Kailash trek via Simikot. If you decide Mt. 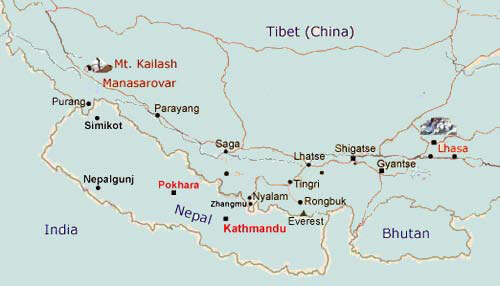 Kailash Manasarovar via Simikot, you might get some flight hassle from Nepalgunj to Simikot due to weather. The Mt Kailash trek via Simikot passes through the spiritual and beautiful landscape of remote western Nepal. This Kailash Manasarovar trek serves both the adventure seekers and religious tourists. Mt. Kailash holds great value to Hindu and Buddhist people. For Hindu people this is a holy place, a pilgrim and other people who don’t belong to this religious group this place is a heaven. For thousands of years people have journeyed to this special place to pay their respect and to circumambulate and this process continues to the date. In the later centuries this place has changed its image from just a Hindu pilgrimage site to the most beautiful mountain region in the world. You can visit Gyandrag Monastery if you make one more night at Darchen. It is located about five kilometers from Darchen village. It takes three hour to get Gyandrag Monastery. It was built in 12th century by Zhikon Kuyay Ganpa and has more than 800 years history. This monastery was belonged to Kagyu sect. This monastery was renovated in 1985. It makes you better acclimatization. 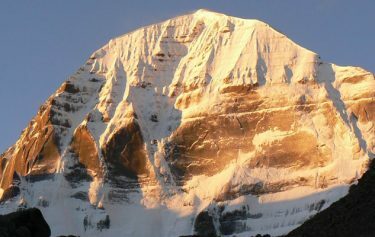 Mt Kailash is a symbol of belief not only nature beauty.The king of Holy Mountain, Mt Kailash also known as Mt. Meru, the center world of Buddhism where founder of Buddhism, Sakyamuni used to perform Buddhist rites or the hall of the Lord Shiva in Hinduism. It is not an imaginative world mentioned in Abhidharmakosatra of Buddhist scripture but Real Mountain. 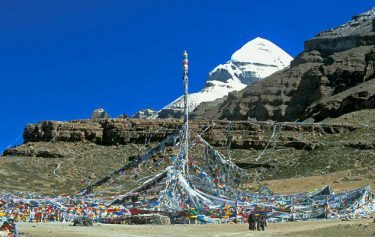 The Mt Kailash peak is the highest snowcapped peak in the Grandiose range, meaning “precious snow mountain or saint in Tibetan”. Mt. Kailash is a sacred Mountain in Tibet. Exciting Nepal Treks and Expedition organizes Mt. Kailash Manasarovar Trek via Simikot from Kathmandu for you. Join us for the tour. – Mt. Kailash, Kora/Parikrama (56km trail) for two and a half days. – Spiritual journey to Mt. Kailash and Manasarovar Lake. – Natural Hot Springs, Old Monasteries, Tibetan Medical School at Darchen. Day 01: Kathmandu Arrival (1400m) – Overnight in Kathmandu. Day 05: Drive to Manasarovar Lake (4550m) – Overnight in Mansarovar. Evening – A short briefing about Kailash Mansarovar Yatra. After Breakfast – Half day sightseeing of Pashupatinath, Temple. Fly to Hilsa to Simikot (20 mins) by Helicopter – Fly from Simikot to Nepalgunj (around 1 hr)/ Surkhet and fly back to Kathmandu (or proceed to Lucknow by Road), End Trip. Twin sharing basis hotel in Nepalgunj with meals. Nepal restricted area trekking permit fee. Hilsa to Sher porter charges. Yak, Yak men during trekking. All Service Charge and Government Taxes. Insurance of any kind and Helicopter evacuation cost. Flight fare to and from Kathmandu.